The visitors equalised in the 63rd minute when Coleman inadvertently sent the ball into his own net after Pereyra's header came back off the upright, sparking an incredible series of events. Doucoure seemingly completed the turnaround 130 seconds later with a powerful header into the ground and past Jordan Pickford, taking advantage of a deflection on Pereyra's cross. Just when Javi Gracia's side looked to have done enough to draw level on points with their opponents, Digne curled a delicate 20-yard strike home to punish Kabasele for a needless handball. The former Barcelona defender took matters into his own hands after seeing Sigurdsson eye up the late free-kick, sending it out of Foster's reach to rescue what seemed an unlikely point. Digne also created three chances for his team-mates as he proved a regular threat attacking down the left. Sigurdsson's improved form coincided with Silva's arrival at Goodison Park, but it is now three games without a goal or an assist for the Iceland playmaker, whose penalty miss proved costly. Were it not for Digne's brilliant late strike, the focus would no doubt have been on another sub-par performance from the ex-Swansea City man. 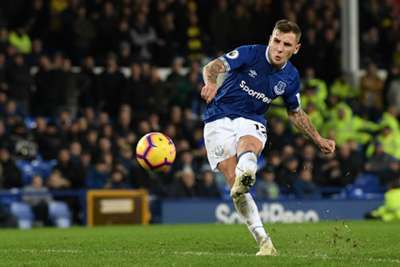 - Digne’s equaliser for Everton was the second-latest goal in the Premier League this season at 95 minutes and eight seconds, behind only Ross Barkley’s strike for Chelsea against Manchester United in October (95:27). - Watford remain winless in all 13 of their league trips to Goodison Park against Everton (W0 D2 L11). - Sigurdsson has failed to convert two of his last three Premier League penalties as an Everton player, after scoring each of the six before that while at Swansea. - Only Burnley (nine) have conceded more Premier League goals in the 90th minute or later since the start of 2017-18 than Watford (eight – level with Southampton and West Ham).